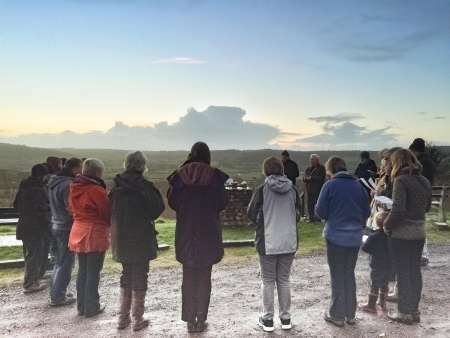 Easter Sunday is, as normal, a day packed with services but for many the most memorable will be the dawn service held at 6am at the Hillhead picnic site in Colyton. It’s well before most people are out of their beds, so there will be little traffic and a chance to enjoy birdsong and a stunning view across the Axe Valley. There really is no better time of day to celebrate Easter, which all began with a surprise very early one morning. A group of people had seen their visionary friend arrested, and then seen him executed in the cruel method reserved for those most hated by the Roman Empire. Their friend Jesus had been buried, and they thought their story was over. Early the next day something new and strange happened to a young woman, Mary, a friend of Jesus. Someone appeared to her, and whether it was mist or the uncertainties of dawn light, she thought the man talking to her was a gardener. Something powerful had happened, something so strange that witnesses fled in fear, and people passed on the story in hushed voices. Death hadn’t closed down the story at all – just the opposite. What seemed like an ending, the ending of everything important, was in fact the beginning of something new and life-giving. We know the story well. A story of something that happened in the uncertain early light of a spring day, and an event we constantly associate with spring, green shoots, new growth. Spring is always a wonderful pick-me-up after a hard winter. This season has something extra on offer – things bursting into flower, sunlight, and the promise of warm days ahead. Dawn has always been seen as an important moment in all religions. In Islam and Christianity it’s the moment when the first prayers of the day are said. Dawn is of course not a moment, but a transition from pitch black to full sunlight. Photographers talk of the ‘golden hour’ before the sun breaks through, when the light is much warmer and softer than the harsh light of noon. It’s a time when we come round slowly, allowing all our senses to kick in and enjoy the early hours, wondering what the day might bring. A lovely old English word for the dawn is ‘dayspring’, in regular use at the time the King James translation of the Bible was composed. It sometimes meant the exact point on the horizon where the sun was predicted to rise, a point that changes as the year turns. The word Dayspring is used to describe John the Baptist as the one who brings light to those who live in darkness, and was later and much more frequently used to describe Christ himself, not just the light bringer, but the light of the world. So much for history and theology, so much for thinking. Perhaps it’s equally good to enjoy the golden dawn light as the created world sings itself awake and fills us with new hope.